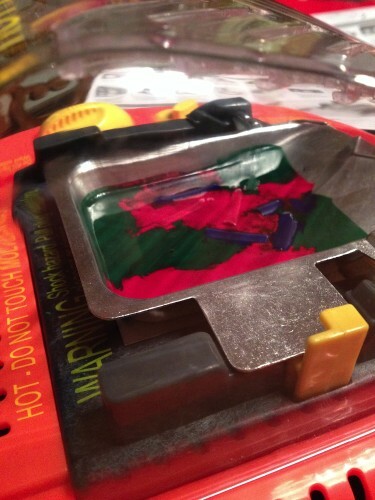 I received a Crayola Melt ‘N Mold Factory to try out and review. Opinions of the product are 100% my own based upon my experience using the product. Also I love Crayola and won’t let the kids use any other crayons.I was walking through Toys R Us one day and saw the new Crayola Melt ‘N Mold Factory. 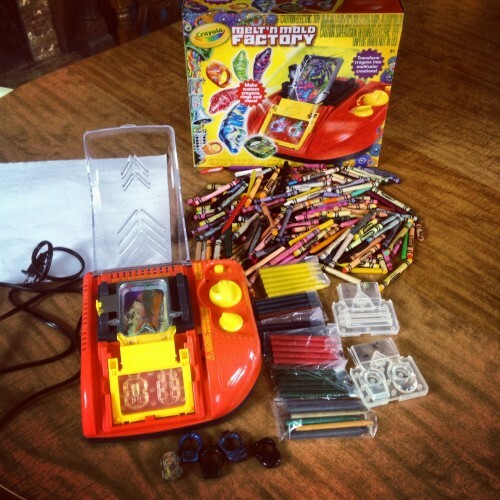 I had wanted to get a Crayola crayon maker last year but never got around to it so when I saw the Melt N Mold Factory again at Time to Play I asked if I could review it. I also wanted to try out the cruisers mold because, who wouldn’t want crayon cars. So, I received the Melt N Mold Factory and got work right away. I started off by playing around with the buttons and dials and accidentally learned about the safety locking feature on the factory. Setting up the factory you clip in the metal melting pan, load it with three crayons and then close the cover and set the timer. To set the timer you turn a dial and when you turn past a specific point the cover locks so that little – and big – hands are unable to touch the hot metal try and melted crayons. It takes about 20 minutes for the crayons to be made. So when I first went to try the product I turned the dial which locked the cover and it did not let me open it up for almost 20 minutes. My fault, I should have read the instructions first. It is a good safety feature though. We have a ton of crayons around the house in various states of breakage. That is probably the case with many, many homes the world over. Crayons are inexpensive and even though they break people tend to keep them. We have a ton and my son loves to peel off the paper on each one he gets his hands on so I have many, many crayons to use in the factory. If you don’t have crayons kicking around that is okay because the factory provides you with enough crayons to create plenty new crayons with the molds. 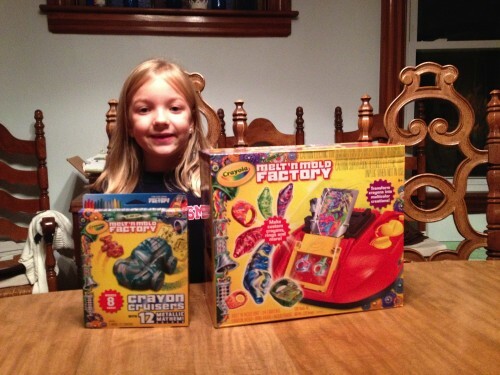 The factory comes with two molds, one to make rings and the other to make crayons. 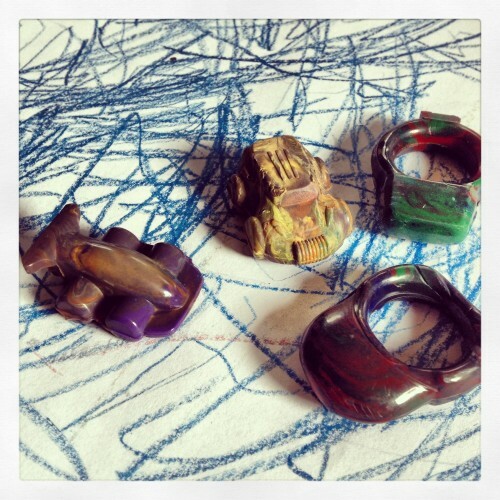 There are additional crayon molds that you can purchase that make other rings, crazy crayons, planes and even cars. I also got the cruiser (cars) mold to use in the factory. That set came with metallic crayosn to use in the factory. I think that the crayons came out really great. The creation time was a little long so you can’t make a ton of them at a time. The other thing I noticed is that you can’t really clean the metal tray. There are two reasons for this. The first is that if you snap the tray in it is in very tight and you don’t want to keep taking it off of the factory. The second reason is that by the time the cover can be lifted the tray is no longer hot and the wax is hard. It doesn’t bother me though because even though there is still some wax left in the pan it melts off in the making of the next set of crayons. The toy does what it sets out to do, it is a little slow to make the crayons but it is still fun to see the finished products.